We are writing this letter to inform you that check [Check Number] was returned to us for [reason returned (i.e. insufficient funds, stop payment]. The checks were written to on [Date – dd/mm/yy] for [Product/Service]. (Describe in your own words). Please send us a money order for [Money Amount] which includes [Money Amount] service charge plus the original amount. We would advise you not to delay to rectify the problem. A bad check will affect your credit once it is notified to a national check guarantee system. (Explain the actual cause and situation). We need to hear from you by [Date – dd/mm/yy]. If you have any problems, please feel free to call me at [Phone Number]. 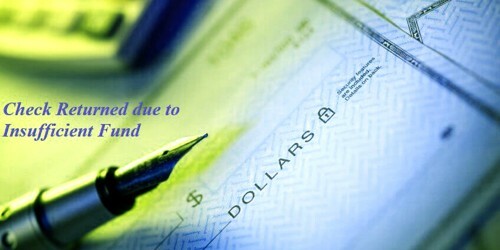 Your check (Account number) of (Money Amount) was returned to us marked “insufficient funds”. Kindly do something about this matter as soon as you can. You may pay us in cash or send us a money order of (Money Amount). The (Extra money) fee is for the returned check. (Describe in your own words). We truly appreciate your commercial transactions. We are thankful to you for your consistent business relations with our company and would appreciate it if you would look into the above matter as soon as possible. (Describe your requirements).